It's challenge #3 over at Crafting When We Can Challenges and I hope you will be able to join us. The theme for challenge 3 is a Bingo Card. 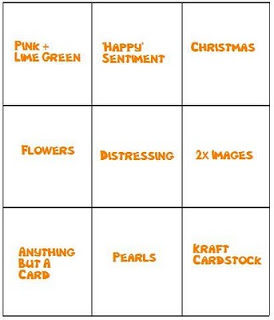 The idea behind the bingo card if you don't know is you chose 3 items off the card in a line (horizontal, vertical or diagonal). This week our sponsor kindly let us choose an image from their store and I chose Halen in Wreath. I was going to make him into a wreath to hang on the door/wall but as other members of the DT chose the same line I decided to make a card instead using the vertical centre line 'Happy' sentiment, distressing & pearls. The plain green and red paper is from my stash I don't know the manufacturer but I got it from a local craft shop (who also does online sales) Craftden Studios, the patterned paper is from K&Co. the sentiment is from Craftworks and I used Copics and Promarkers to colour the cute image. I used my Craft Robo to cut out the poinsettia in the corner and put yellow pearls (which came in the drawers of a white spinney pen holder from Create and Craft). I popped up the wreath with pads and layered up Halen and the bow then stuck the sentiment as if Halen is holding it. 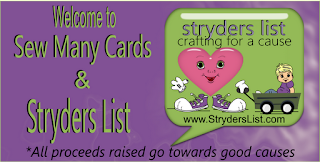 I am really enjoying making cards again, being on the DT has really brought back my enjoyment in crafting. Today me and my OH should be sorting out some more stuff from the bedroom so I can put my new desk up and hopefully move some of my craft stuff up there. My Craft Robo and Big Shot are already there and now I don't have to keep stretching up to get them hopefully they will be used alot more. NO not HOPEFULLY, they will DEFINITELY be used more. Hope you are all having a fantastic weekend, it's been one of my best for a long time. 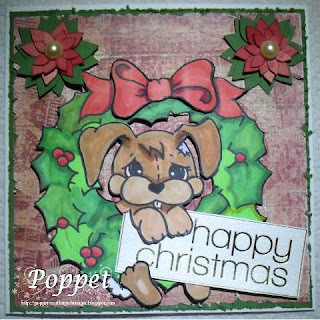 Great fun Christmas card Poppet I hope that little bunny doesn't have to hang there all Christmas! Thank you for joining in at Cardmadfairy's Digi Days this time. 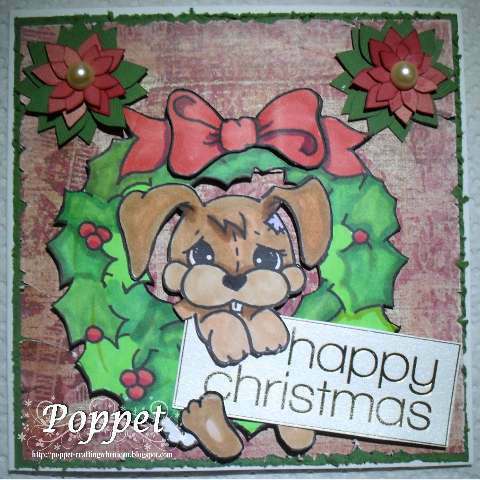 This is a real cutie Poppet!